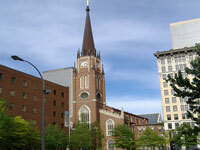 The Cathedral of the Assumption is the fourth oldest public building in Louisville as well as the third oldest Catholic Cathedral in the United States in continuous use. Designed in the neo-Gothic style by William Keeley and Isaiah Rogers, the Cathedral was completed in 1852. The steeple rises 287 feet (84m) above the Louisville skyline, and upon its completion, was North America's tallest spire. The chancel window is one of the oldest surviving examples of hand-painted stained glass in the country. The Cathedral of the Assumption is listed on the National Register of Historic Places and is an active, urban parish with 1,500 registered families. Audio tours are available and docents conduct guided tours by appointment only. Opening times: The Archdiocesan History Center is open 10:30am-2pm on Sundays.